4 or 5 years ago at Road Atlanta, a group of guys drove the Jaguar XJ they had rented for the weekend from Hertz or Budget. Not bad! For the right price I can make sure of that. FWD rental car + McDonalds plastic trays under the back wheels + parking brake = fun. A friend of mine rented a BMW Z convert to do the BMW Ring school some years back. Needing seat time in a hurry, he left the rental parking lot drifting the car down the garage ramp, pulled up to the automated ticket booth and promptly opened the door in a steel barrier putting a huge ding in the door. You could not turn around or get back over the tread gates once you exit. Not hearing traffic, launched it backwards up the ramp 3 floors, (no cars behind him). Went back inside and asked them to note his paperwork for a ding they missed in pre-inspection. Another renter with us called the agency to get a new car because the rotors were warped. They could not reproduce the problem at the exchange place of course. (You had to do half a lap on Nurburgring to get them hot enough). It appears the days of rental cars on the Ring are going away unfortunately. that vette had rental company installed GPS and I asked the driver if it also reported to the rental company. He did not know but it would be interesting to find out if he got dinged for "speeding". A guy from the west coast flew into Ohio to run at Mid-Ohio DE a few years ago. He rented a Chysler 300. After two sessions, he cam in dripping brake fluid everywhere. Turns out he blew out a caliper piston seal. He drove it back to the rental company using the e-brake and got another car to run the track. Plastic water meter covers are better than trays. They are hard ABS plastic that you will not wear through. Tray Slides a lot easier when the plastic stays for multiple slides. These are just some of the things I have heard of guys doing to rental cars. Did I also mention putting the car in neutral, pulling the ebrake on the highway, doing a 180 so you are going backwards down the interstate, and then whipping the car back the right direction at 80 MPH? Or using a loading dock area as a mini halfpipe for a minivan? Several years ago (right after VIR reopened) the chief instructor at a BMW event drove around in a rented Taurus. I think it lasted two sessions before the tires and brakes were shot. He parked it the rest of the weekend. I've never heard tires howl like that since! We once brought back a lincoln after a weekend at Road Atlanta with rear tires corded(best burnout ever! ), a minivan so covered in Georgia red clay that you could see out of the windshield in spots only(parked in a field, ebrake on, full throttle in reverse. Worked like a mud sprinkler) , and a rental golf cart that we off roaded. It was a great weekend. Please, that one pales in comparison to the some of the others. Or have the statute of limitations not expired on the others? 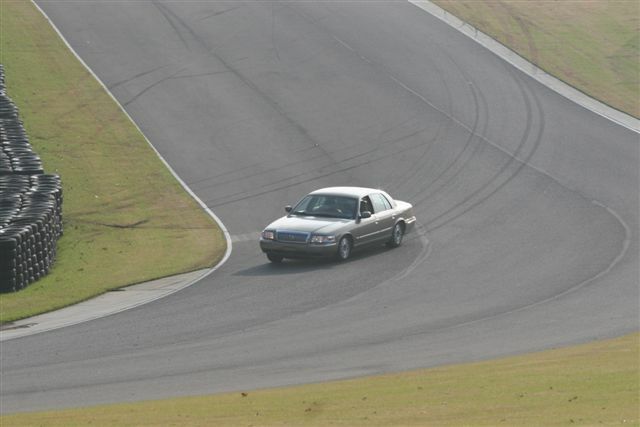 ...and then there are the epic Grand Marquis rental car track sessions at BMW events at Barber.